To support Sub-Saharan African governments and their stakeholders in their efforts to increase supply chain linkages to hosted mining activity, this research focuses on the relationship between local procurement regulations and mining company practices in the South African and Namibian mining sectors. South Africa was selected as the “primary” country where legislated local procurement regulations have existed for a minimum of two years at the national level. Namibia was selected as the “control” country where no legislated local procurement regulations exist at the national level. This research examines the extent to which comprehensive local procurement regulatory frameworks are effective in making mining companies purchase more locally. Also, this study explores the common factors that influence mining companies when creating local procurement strategies. To provide a reference and to support these research aspects, an overview of development theory is included regarding country efforts to access global value chains (GVCs) and to engage in industrial upgrading. As well, the specific approaches of South Africa and Namibia are summarized. 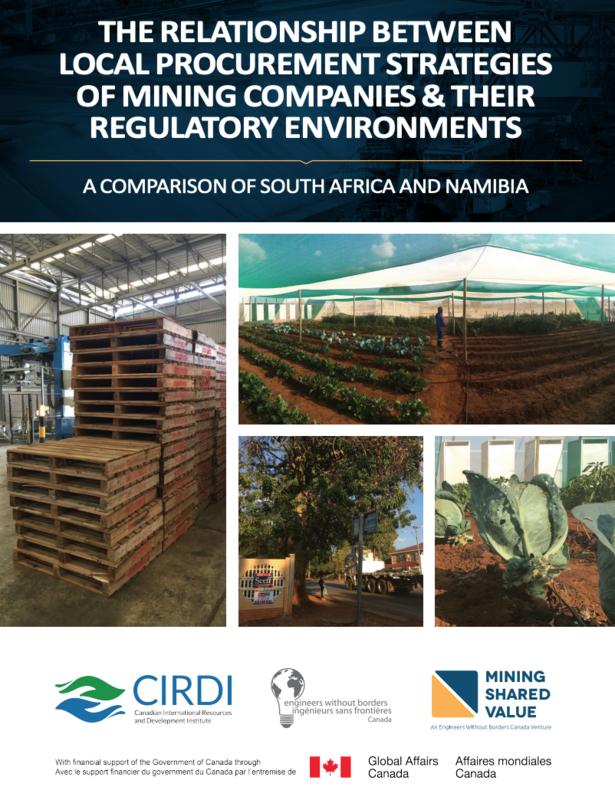 Empirical evidence on how mining companies engage with regulations requiring local procurement has been relatively absent even amidst dramatically increased attention on local content regulations – this research contributes to addressing this gap.